By simple configuration, Spring boot provides a powerful way to work with a single database. Sometimes you need to work with multiple databases (for example, one for basic usage and another for archiving). In this tutorial, we will see how to make Spring Boot multiple databases configuration. Let’s consider the following case : We want to store authors and their books in two different databases. The first one, a MySQL database in which we will store the authors, and the second is a PostgreSQL database which will contain the authors books. 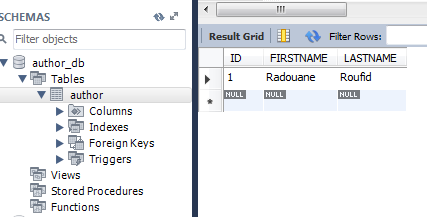 Note that the properties for each data source are quite similar expect for the prefix part. In fact, we will tell Spring boot to pick up the correct prefix to configure the adequate database. Our main class is defined is Application.java. It’s annotated with @SpringBootApplication which is equivalent to using @Configuration, @EnableAutoConfiguration and @ComponentScan all together. * Spring configuration of the "PostgreSQL" database. * @param builder an EntityManagerFactoryBuilder. @Configuration: indicate that our class declares @Bean methods that will be processed by the Spring container to be used at runtime. @EnableTransactionManagement: used to allow the usage of annotation-driven transaction management capability. The first step is to define the datasource. With the annotation @ConfigurationProperties we tell spring to pick up the data source properties that are prefixed with spring.postgresql.datasource from the application.properties file and build a data source using DataSourceBuilder. @Primary is to handle multiple autowire candidate. This annotation is used because our application have two bean of the same type. So the bean of type DataSource of the PostgreSQL database bean will be given preference. 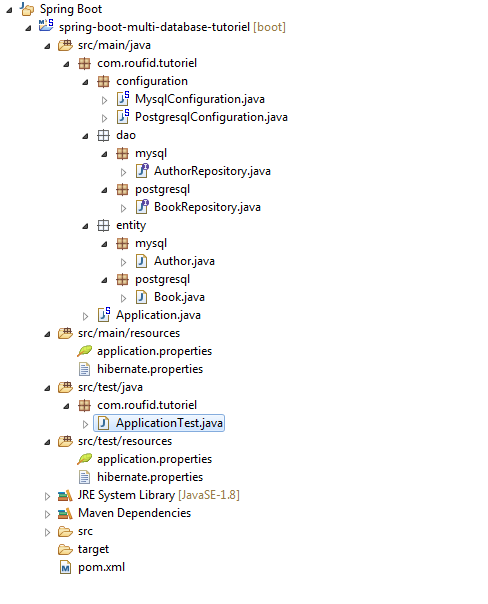 This bean creates a JPA EntityManagerFactory that will used in the JPA repositories. Note that you must specify the package where your entities are located. You can set com.roufid.tutoriel.entity.postgresqlrather than Book.class. I use the hibernateProperties() method to load some hibernate properties from the file hibernate.properties I put in classpath. It’s done, our PostgreSQL data source is ready to use ! The MySQL data source definition is quite similar to the PostgreSQL data source. The difference lies in the prefix that will be used by Spring to load the data source properties and the packages where the entities and JPA repositories are located. * Spring configuration of the "mysql" database. The MysqlConfiguration class is annotated with @Configuration because it also declares @Bean methods. We enable the usage of annotation driven transaction management with the annotation @EnableTransactionManagement. @EnableJpaRepositories: We set entityManagerFactory and the transactionManager beans to be used in the JPA repositories of the MySQL database. 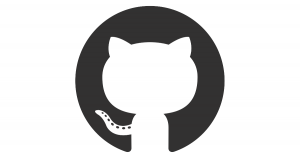 The repositories to be scanned are located in the package com.roufid.tutoriel.dao.mysql. We tell spring that the properties to define the mysql data source are prefixed with spring.mysql.datasource. The entity manager factory and the JPA transaction manager of the MySQL data source are approximatively the same. The only differences are the data source used by entity manager, the package to scan to find the entities and the persistence unit name. Consider the following basic example to test the application : Le’ts create an author to which a book will be associated. Then we will try to find the author of the given book. 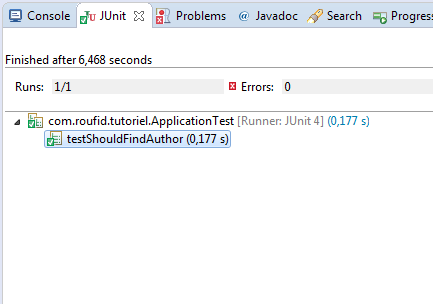 Spring boot test will be used in this example combined with JUnit. * Will be executed before the methods annotated with code @Test. * Test should find the author's book from the PostgreSQL database.